Here at Invertek’s HQ in Wales, we love hearing about the innovative ways our variable speed drives are being used around the World to solve a huge range of problems. Brisbane based Invertek Australia was approached by Paul Asher from Australian Turf Machinery (ATM) for help with a unique problem: to help create an electric mower that delivers the required performance without a gearbox – essential for keeping bowling greens in pristine condition at all times! ATM manufactures a range of specialist lawn care equipment including mowers, drillers, rollers and groomers that have been specifically designed to keep bowling greens in perfect condition. The solution? 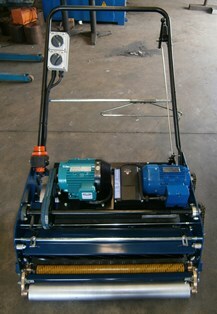 An electric mower with an Optidrive PCE from Invertek! Optidrive PCE offers all of the features of Optidrive Compact, with the convenience of an IP55 rated motor mount enclosure to protect against dust and fluid ingress. Its robust housing provides high vibration resistance and the full open loop vector motor control offers optimum performance, even in demanding applications. The constant torque of the PCE ensures the mower can power through the turf regardless of the overgrowth and the speed is controlled via an externally mounted potentiometer. This eliminates the need for oily, messy, noisy motors and gearboxes - all customers need is a long extension cord! ATM is now marketing its invention as the ‘ATM Optidrive 30’ Bowling Green Mower’ – and not only does it enable green keepers to achieve a pristine finish, the Optidrive’s noise control capability also means lawns can be cut at any time of the day without fear of disturbing the neighbours!